Auditioning Borders - Opinions Welcome! Thread: Auditioning Borders - Opinions Welcome! This is a D9P for a baby girl whose Mom requested "bright & cheerful & graphic". Just finished putting on the polka-dot stop border and now I'm totally stuck. Can't decide between the hot pink tone on tone dots, the pink floral, the stripe or the multi-color ethnic print. And if none of them are right, please say so! It seems that the pink ones don't pick up color from the body as well as the bottom one. I like the stripe border best! I like the bottom one - the two pink ones are too pink, and the dark stripe is attractive but a bit heavy for the airiness of the quilt itself. Lovely quilt - I particularly like the swirly background fabric...which would also make a good border. I vote for the tone-on-tone pink. Keeps the eye on the piecing. May not be so matchy-matchy but it works for me. sorry, but i don't care for any of them. to me, your red squares [at least they look red on my computer] jump out at me. so i would choose a quieter border in the red. I like the top one! Not sure were much help! Lol good luck! Shell love which ever you choose!! I like the look of the almost solid pink but would like it better in orange or red. Okay just to confuse you more How about the pink tone on tone for the ends & the top pink/orange for the sides? actually I do not like any of the ones you are showing. I maybe agree with "alisonquilts" that the background fabric might look nice. What is the color of the nursery? or what color does the mothher like. How about a aqua blue or maybe a yellow. the main color that I see is the orange but that maybe alright if it fits in the nursery. Love the quilt center, the border choices, not so much. I agree with bigsister63 or QuiltnNan for other options. Do you have more of the BG fabric that you used? I think that would look best. My second choice would be red to match your small blocks. I like the top one best. Background fabric would be my choice. It's a very nice baby quilt so whatever you chose will be just right. Hmmm, the left pink one or the bottom one. if you want to use either of the other two i'd insert a skinny inner border of some color. I don't see any pink or purple in the quilt at all. Keep on looking, you'll find something that speaks to you perfectly. I agree with the others who don't like any...Maybe a narrow one of a strong block color and then if you have more of the background fabric I would use it...or at least look at it and see how it looks. None of the above. Any one of the prints in the big squares would be a better choice. I think the bottom one echoes colors in your piecing and maintains the energy and vibrancy. I agree with alisonquilts on why the other 3 don't seem to work as well. 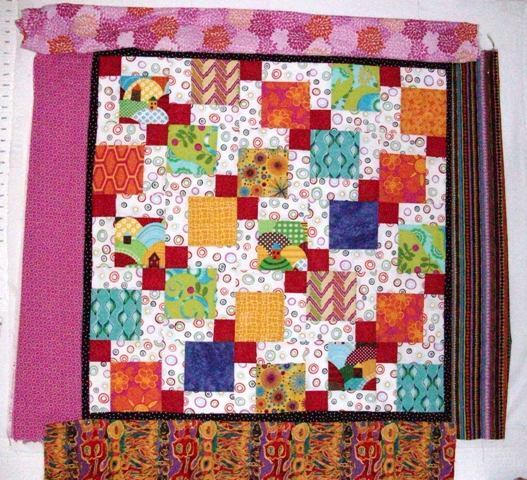 If I were to use one of those fabrics, I would choose the bottom one as it allows the blocks of the quilt to be projected instead of competing with them. The dark fabric allows the white in the background to pop out. I like your baby quilt! I agree, tone on tone. I see the red or orange first when I look at the quilt - don't see any pink or purple. If I had to pick one that is featured if would be the bottom one. Now I think we probably have you totally confused! I wasn't crazy about any of the displayed borders either, but couldn't put my finger on why. Thank you all so much for helping me to clarify. I've decided to try a border of the white background squiggle fabric and then bind it in the bright red of the little squares. The backing will be the white squiggle. Thank you! I feel so much better now.